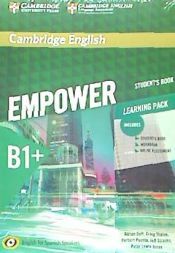 El autor de Cambridge English Empower for Spanish Speakers B1+ Student's Book with Online Assessment and Practice and Workbook, con isbn 978-84-9036-165-8, es Adrian ... [et Al.] Doff, esta publicación tiene doscientas noventa y seis páginas. Otros libros de Doff, Adrian ... [et al.] son Cambridge English Empower For Spanish Speakers B1+ Student's Book With Online Assessment And Practice, Cambridge English Empower For Spanish Speakers B1 Student's Book With Online Assessment And Practice, Cambridge English Empower For Spanish Speakers C1 Learning Pack (student's Book With Online Assessment And Practice And Workbook), Cambridge English Empower For Spanish Speakers C1 Student's Book With Online Assessment And Practice, Cambridge English Empower For Spanish Speakers A2 Student's Book With Online Assessment And Practice, Cambridge English Empower For Spanish Speakers B2 Student's Book With Online Assessment And Practice, Cambridge English Empower For Spanish Speakers B1+ Student's Book With Online Assessment And Practice And Online Workbook y Cambridge English Empower For Spanish Speakers B2 Student's Book With Online Assessment And Practice And Workbook. .